Widely distributed in parts of Peru, Colombia, Venezuela and Brazil. It’s been collected in various rivers including the Ucayali, Amazonas, SolimñÆ’Ã‚Â´es, Amapá and Oyapock. It most often inhabits silt-laden, slow-flowing rivers. 48″ x 18′ x 18″ (120cm x 45cm x 45cm) litres for a single adult male or mated pair. A sand substrate is preferable, with large pieces of bogwood and smooth boulders as additional decor. Plants can be used if you wish, as it doesn’t usually dig. If you want to breed the fish place some pieces of slate vertically up the sides of the tank, to act as potential spawning sites. 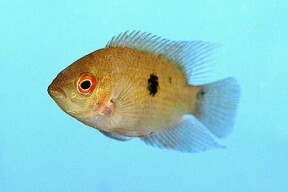 Temperature: Prefers warmer water, from 77 – 86°F (25 – 30°C). It’s omnivorous, feeding on a variety of invertebrates, algae and other plant matter in the wild. Happily it proves similarly unfussy in aquaria. Offer a varied diet including live, frozen and dried foods. Despite its large size this is actually quite a placid species and can be kept in a community of large fish in a suitably-sized tank. Possible tankmates include large cyprinids, characins, catfish, Loricariids and in a very big tank, other South American cichlids.